This is a non-electric bed lift that was built for a stealthy cargo trailer to tiny house conversion. 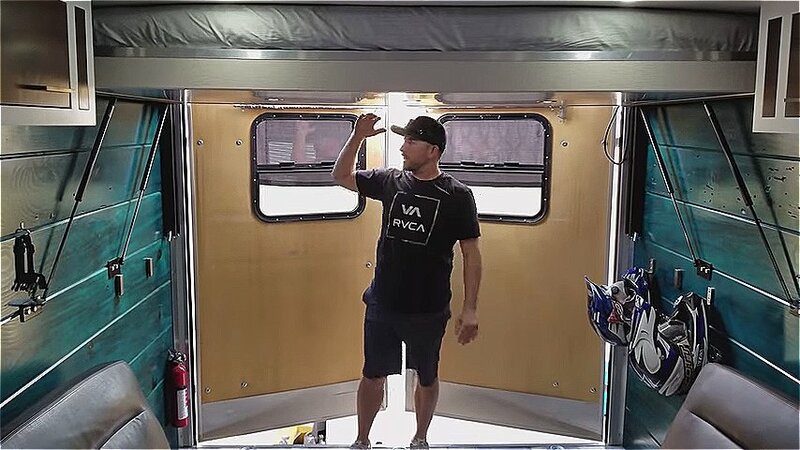 This is a walk through video of how i built my drop down bed system in my cargo to camper conversion i hope it’s not too confusing and is helpful with your own builds. This bed-to-ceiling system could also work for van conversions, tiny homes, and in other small spaces to create more multi-functional space. What do you think? Non-Electric Bed Lift System For Tiny Homes So You Can Store Your Bed into the Ceiling! Very smart young man, patent that baby and sell the kit. You can let yourself go in many ways: When tired you lie down on the chaise longue; when you love the warmth of the sun on your body, which adheres to the sand; or when you abandon yourself to the shiver of a caress. But all this can not missed the relaxation you can experience in the intimacy of a “Small House” made to measure your ” Vital Breath”…..
young man I am blown away — the thought-detail-efficiency-knowledge-practicality-aesthetics of this project is just so impressive!!! Have a wonderful time in your travel adventures – but think about using that ability of yours to find other small space solutions – you have a gift! I’m interested to know where you purchased your gas struts from please.